Well, here we are at another Throwback Thursday and I want to show you my entryway from last year. I had just painted all the black and white pieces for the entry and decided to do something just a bit different for fall out there. So I let my imagination sort of run with it and I decided to use black, white and gold with just a few touches of orange. I also mixed up several different geometric designs to keep it just a bit more interesting. I loved it all. It was different, it was whimsical and it was definitely outside my traditional box. 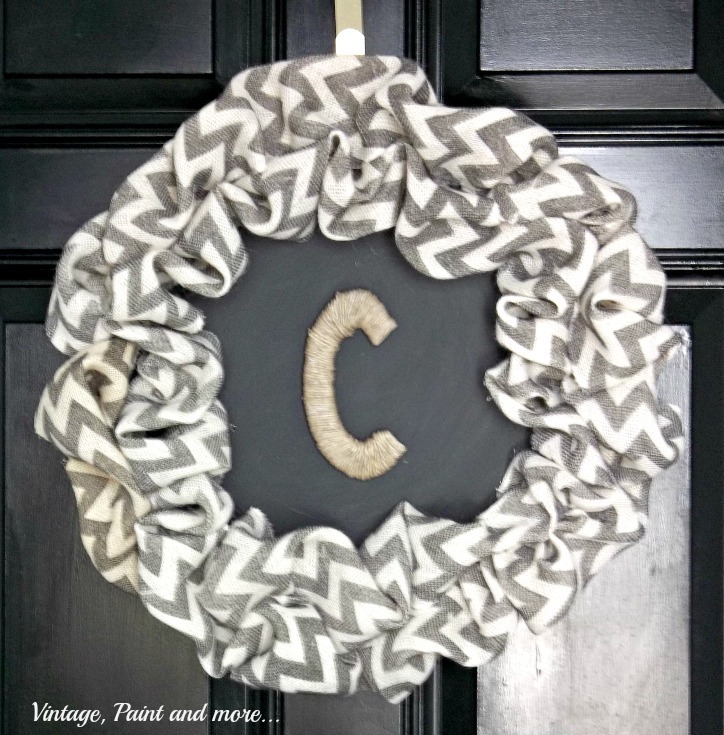 I started with this wreath I made from a Dollar Tree silver tray and a roll of black and white chevron ribbon. It was so unexpected and I loved making it out of really different items. I did chalk stripes on our chalk board and then wrote our little welcome with orange chalk. I like using color chalk as it gives the boards so much more interest. 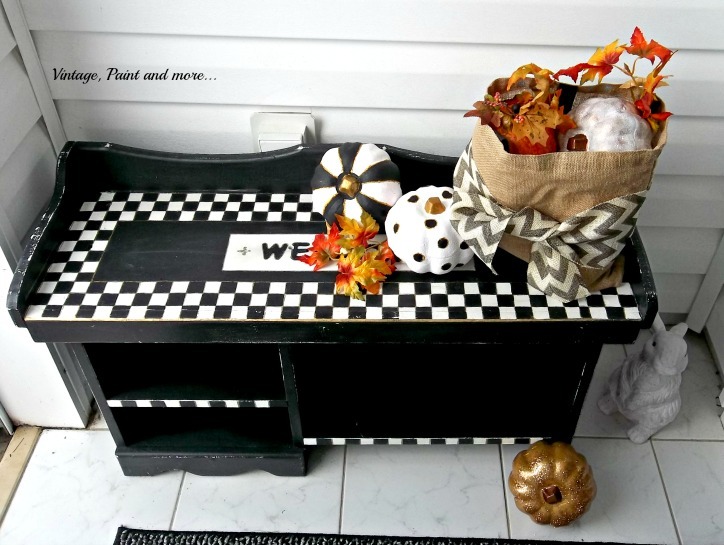 Then on our little black and white check bench I placed a burlap bag with a piece of chevron burlap ribbon tied around it. 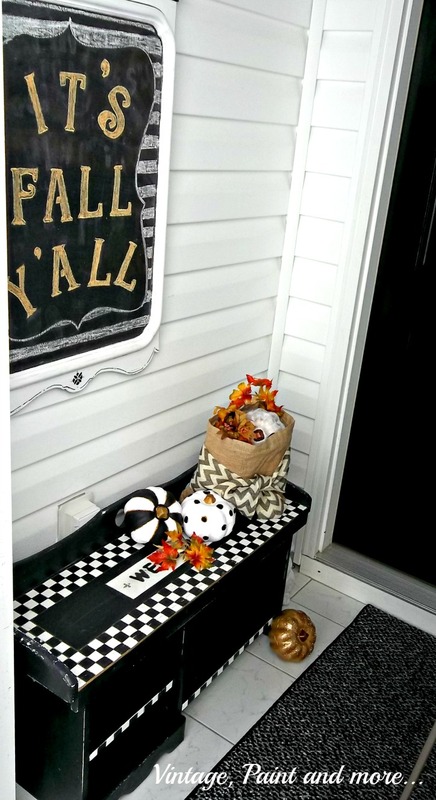 I filled it with some pumpkins and "faux" leaves to look like we had just come in from the pumpkin patch. 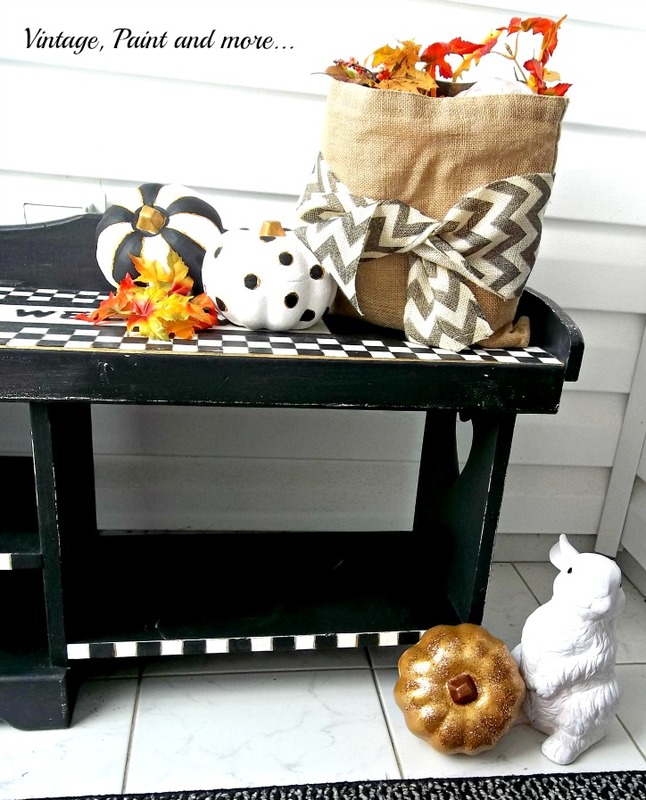 I painted some Dollar Tree pumpkins with black and white stripes and polka dots then touched them with a little glitter and gold. Not your usual pumpkins you find in a pumpkin patch! I loved this little vignette. I loved how whimsical it was and how it just brought a smile to my face each time I came into the entryway. Sometimes you just have to go outside your comfort zone and do fun - you just never know what you might come up with. 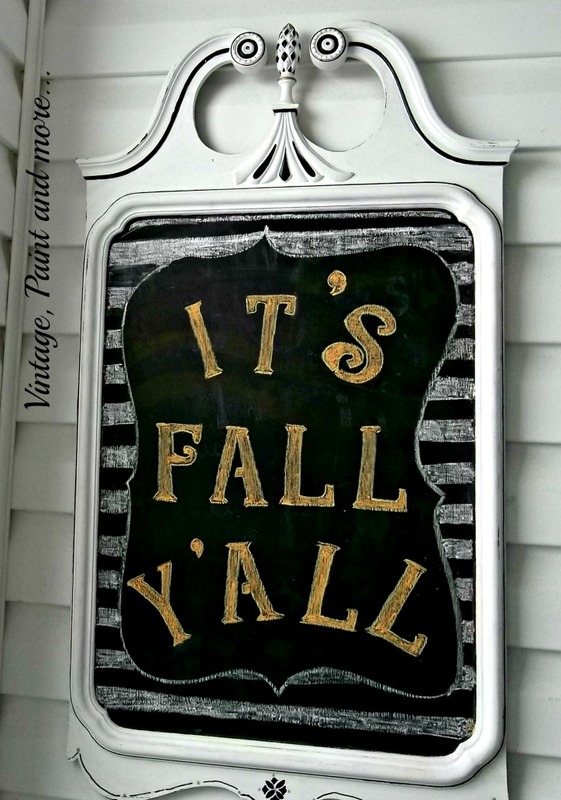 What are you doing for fall this year? Are you staying with your tried and true pallet or switching it around a bit if you do decorate? I love to hear from you so tell me all about what you are planning in the comments below. I answer all comments via email. I will be linking up to the parties listed on the Where I Party page. Stop by and visit them you will find so much inspiration there. I agree this is really cute. 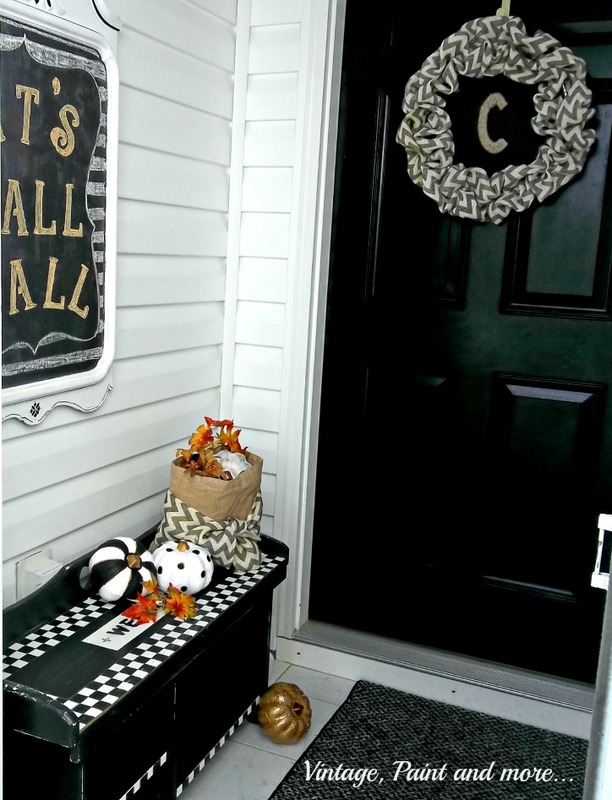 Love this fall entry. I have been wanting to do one at my place but not sure how I can do it as I don't have lots of room...but some of your ideas may work. Thanks for sharing and I am pinning this. I always love your entry way! You have such creative ideas!